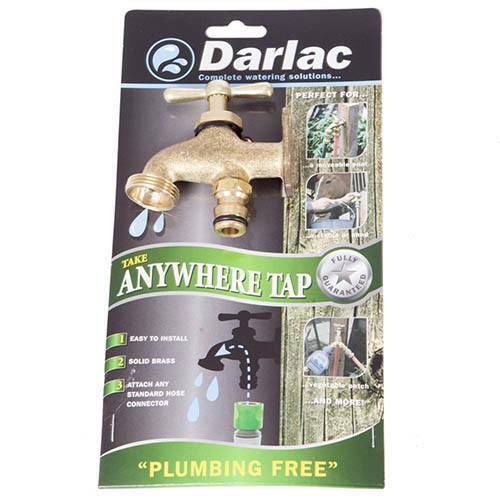 Incredibly versatile, The Darlac Take Anywhere Tap allows you to take water with your around the garden or allotment! Made from solid brass, simply screw the tap to a suitable vertical surface like a fence post, wall or shed and connect to a fixed water source with a length of hose just underneath the tap. It can be used as any normal tap having a 3/4' threaded outlet, even in conjunction with a 2 or 4 way tap manifold to give even greater flexibility and all the fixings you need are provided. It can be used as any normal tap having a 3/4' threaded outlet, even in conjunction with a 2 or 4 way tap manifold to give even greater flexibility. Incredibly easy to set up, all the fixings you need are provided. Note: Do not leave outdoors in freezing conditions. Supplied as one tap with fixtures included.